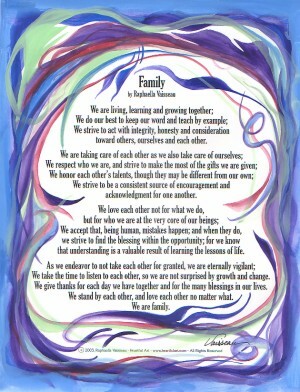 Poster or print of FAMILY poem with original words and art by Raphaella Vaisseau, a spiritual meditation for families to strengthen family bonds, communication, support, understanding, and love. Gift for Anniversaries, Father's Day, Mother's Day, new baby, house blessing, and Weddings, Vow Renewals - any occasion where family is affirmed and celebrated. Love your family. Share your heart with each other.